With summer in full swing, it’s a great time to take a long weekend, get the whole family loaded in the car and head to Byron Bay. On a Byron Bay camping holiday you can swim at gorgeous beaches, hike nature trails, spot wildlife, browse the markets and sample great food. Plus, by making it camping weekend, you and your family will get to have loads of fun without the guilt of overspending on a holiday. Check out our prices on unpowered and powered campsites and see for yourself how reasonable a long weekend holiday can be! After you book your campsite at Broken Head Holiday Park, it’s time to think about the camping gear you need to pack. Let’s make sure your family can focus on fun rather than being upset that a key item was left at home. No need to worry because we here at Broken Head Holiday Park have put together the ultimate packing list for you. It will ensure your Byron Bay camping holiday will be a happy, memorable one! Book your Broken Head Camping Trip Now! 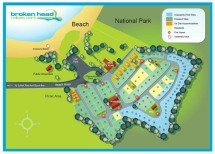 Join us at Broken Head Holiday Park on a fun, budget holiday in Bryon Bay. With the above checklist to get all your camping gear packed, you won’t need to worry about anything but having a great holiday with the whole family. We look forward to seeing you at Broken Head Holiday Park!